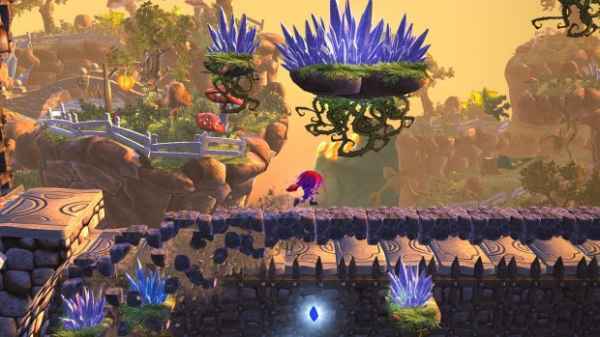 Giana Sisters: Twisted Dreams is a gem of a game that I had the honor of playing, and now reviewing. It’s a beautiful game sporting the Havok engine. Though not quite reinventing the wheel the game takes many aspects from retro gaming and absolutely redoes them. It is a game that does not simply polish existing features from classic games but, it is a game that rebuilds those features into a beautiful experience. Personally I love the game to pieces but it may not be a title for everyone, it does leave a bit to be desired in the story department. What story there is can sometimes be abstract and unclear as to what your actual goal is. The story is centered on the twin sisters Maria and Giana, Maria is kidnapped by a giant dragon and taken into the Dream World and Giana goes after them to save her sister. The game currently does not go into detail with the little pieces of the story it presents to you. I am not sure if that was supposed to be a hook to keep the player playing the game but an explanation of what was going on was definitely needed, and was not delivered. What I loved the most about the game was its whimsical feel, and the seamless presentation of the two worlds the character is in at once and the shifting gameplay change between the two. The game has beautiful artwork and a different theme throughout the levels, though the backgrounds of each area are a bit similar they are stunning and very life like. They also can change dramatically depending on what version of your character you are using. The retro feel and classic game features are also a huge plus (head hopping, brick destroying, secret areas in a level) but leave something to be desired as the only way the game tutorializes is through in game billboards showing silhouettes of what to do, there is no guiding story tutorial or anything in-between. The sound track for the game is a sort of inspirational genre, linking both electronic sound and classic instruments. It fits right in perfectly with the gameplay, the music and sound effects are like that of a new rendition of old classics, fitting right in with the games more classic puzzle feel and gameplay. The music for the game does not change much per level, and has both a ‘cute’ and ‘punky’ styled sound, that is fully dependent on which form you are using, or can be set directly in the game’s settings. The game itself feels very smooth and the transition between forms isn’t really explained by the game either but it is as seamless as it is stunning. The very dynamics of the stage change depending on if you are in a normal/angelic form or the devilish punky girl-esque form, each with their own separate abilities. The combat in the game is a breeze as well but is structured more for puzzle solving and it shows, there is a special ability per form but neither of which can be strung off each other at least not without killing an enemy in-between. 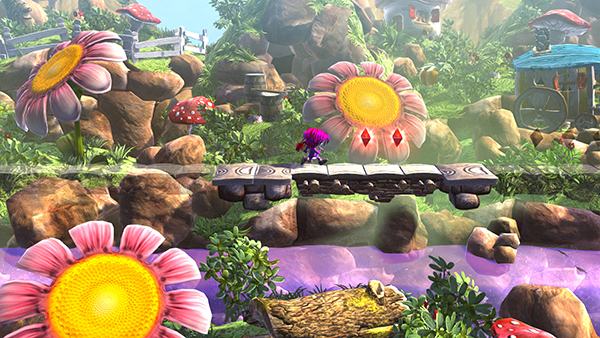 The dynamics of the gameplay for Giana Sisters: Twisted Dreams is one that is simple but difficult to master. The title is a side scrolling puzzle game that presents you with many puzzles to keep you on your toes. To control your character Giana you use the arrow keys on the keyboard while A, S, and D are all special ability keys. A switches your forms, S does a tornado glide and also switches you to your more angelic form and D does a cannonball spin in the upward direction. Both abilities can be directed by the arrow keys and holding down either S or D causes you to be in that ability longer. The controls in their native format are confusing as WASD is commonly used for movement instead of the arrow keys. Like many titles the key bindings in this game are fully mappable, meaning you can change it to your own play style and the same feature is present if you play with a gamepad controller. The game requires you to learn which form is best suited for the puzzle at hand and even changes the puzzle and its difficulty based on which you currently are playing as. The world including the background, music, and enemies change when you switch between the two forms. When you are in your punk-esque form the world around you is far cutesier with a Mario Mushroom Kingdom kind of feel, the enemies also tend to be puffy birds in this form. When you are your more angelic self the world is much more distorted and grim with the enemies presenting themselves to you as winged demons. Some puzzles require you to be in a certain form to complete them while others may hinder your progress if you are in the wrong form. One issue I actually had that was outside of the game itself was the fact that I had a lot of issues with freezing. There are also occasionally frame rate problems, however neither of these are consistent but did add a bit of annoyance while I was playing the game. Giana Sisters: Twisted Dreams is both published and developed by black forest games, and currently is available on steam, gamersgate and gog.com. The beginning of next year bitComposer will be picking up publishing for the game and be both releasing it for the Playstation network, Xbox live arcade, and directly for the pc. If you enjoy puzzle games that have a retro feel and are easy to start playing I would encourage you to pick it up.